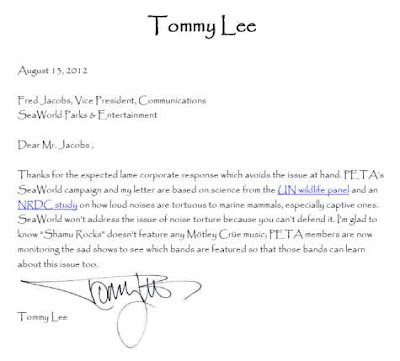 Last week, Motley Crue drummer Tommy Lee sent a note to Sea World asking the theme park to stop using his band’s music and to shut down its “Shamu Rocks” shows for the sake of the animals. Lee teamed up with PETA (People For The Ethical Treatment Of Animals) to address the issue, and now the park has responded. The park’s response failed to satisfy the Crue drummer, who replied to Jacobs/Sea World with a follow-up note of his own. "Thanks for the expected lame corporate response which avoids the issue at hand,” wrote Lee. “PETA's SeaWorld campaign and my letter are based on science from the UN wildlife panel and an NRDC study on how loud noises are tortuous to marine mammals, especially captive ones. SeaWorld won't address the issue of noise torture because you can't defend it. I'm glad to know 'Shamu Rocks' doesn't feature any Motley Crue music; PETA members are now monitoring the sad shows to see which bands are featured so that those bands can learn about this issue too." Motley Crue are currently touring North America with KISS. Motley Crue to host Las Vegas residency in 2013?